The old prophet appeared and proceeded to tell what was going to take place and what was going to happen to Saul and his sons in the battle to come. Now then we read a surprising thing. He had light in the promise of Christ’s redemption. Where did he get it? The word says “sheol” or the regions of the dead. They were there without something. What was it? The deliverance of the Son of God. The prophets prophesied concerning the deliverance the Son of God was to bring, and after Jesus Christ entered into the regions of death and liberated those who were held by its chains, those who had died in the hope of the promise, those who had died in the fullness of faith that the Redeemer was to come. He came and the actual deliverance from the power of death took place. “He led captivity captive, He ascended up on high” and their place of residence was transferred from that place (sheol) governed by the power of death and the angel of death to where-ever the Lord Jesus Christ went “They ascended up on high” and their place of residence was changed. We do not know where those who went with Jesus stopped. You call it Paradise, but so far as Jesus is concerned, it is perfectly plain in the Word that He never stopped until He came to the Throne of God. You go through the Book and find where anyone was ever called down out of heaven, and you won’t find it. Those who have their residence with the Lord Jesus Christ, from the day of His resurrection and onward, would have to be called down, not up. Now one of the things we have lost out of our Protestant faith from the days of the Reformation onward has been the wonderful truth of the ministry of Jesus in the Spirit to the dead. Do you get it? The ministry of Jesus to the dead. “For this cause was the Gospel preached to them that are dead.” Oh, you mean dead in this world, and dead in sins? Not at all, because the rest of the verse explains. On the same grounds that men in the flesh were. They heard the words of Jesus. They received the words of Jesus, or they rejected the words of Jesus, just as men in the flesh do. Well, what does it mean? You ask, “Are you preaching on the subject of a second chance?” No, brother, but I am calling attention to the state of the dead before Jesus came. They died in the hope of the promise. Jesus came and the promise was fulfilled. He fulfilled it on the cross of Calvary, and went into the regions of the dead and fulfilled it to them, and delivered them and took them out the power of death and transferred them to His kingdom. With the above thoughts I have laid a kind of foundation. There is no such thing in the whole New Testament as a re-occurrence of those instances I have just read. No such a suggestion or its possibility in the New Testament. It belonged to a day and an age and a state that ceased to be when Jesus Christ the Lord and redeemer came. Tongues given to Fred Wilson and Interpretation. A number of years ago when I was a missionary in Africa I formed the acquaintance of W.T. Stead, who later was one of the victims of the Titanic. I came to London at his invitation and expense for a personal interview. He took me to his office and after he had become acquainted he introduced this fact. He maintained a spiritualistic bureau associated with his great work known as the Julia Bureau. Julia was a friend who had died, and he believed after she was dead he could contact the spirit of Julia. So eventually he published a book entitled, “Letters From Julia.” Later he changed the name to “After Death,” and these letters from Julia are published in this book. Stead presented me with a copy of the book and requested that I should read it carefully. I did so and made notations of the various letters, and when I got a chance to talk to him I said, ”Julia in a very cunning manner indeed avoids the deity and divinity of the Lord Jesus Christ. Now in order that you may see it, I went over the different letters where reference was made to the Lord Jesus Christ.” I said, ‘‘You listen, Stead, that cunningness is altogether out of harmony with the other statements in the other letters of the book.” When it came to that subject of the divinity of Jesus the peculiar cunningness of wording was observable, even to the most ordinary mind, by which she carefully, studiously avoided any reference to the divinity or deity of Jesus Christ. I said, “Stead, I am going to put you up against the Word on this matter; ‘Every spirit that confesseth not that Jesus Christ is come in the flesh. is not of God.’” (1 John 4:3). W.T. Stead was a big man and a great soul. He thought that he might convince me if I were at all reasonable. Finally a meeting was arranged between Sir Oliver Lodge, Sir Arthur Conan Doyle, W.T. Stead and myself. I want to say a word concerning these two great men. Both have been knighted by the King as knights of the Realm because of their contributions to scientific knowledge. When a knight is knighted he kneels before the King; the King touches him and says, “Rise, Sir Knight,” and so forth. What I want you to see is that a man must have contributed something of unusual value to the Empire in order to be knighted. He must also be able to maintain his social status as a knight. Both men were great men, great as men speak of worldly greatness; great men intellectually; great men in the secrets of science. After we had spent a whole night reviewing these varied things (experiences) that we considered vital, I said, “Gentlemen, I want to tell you of one experience that I think goes further than any of these you have told me. My late wife died in South Africa. I buried her on Christmas Eve, 1908, at Johannesburg. The following sixth of May, which was the anniversary of her birthday, as I sat at the table I occupied an hour telling the family incidents of their mother, and trying to fix the memory of their mother in their young minds. The baby was only eighteen months old and the eldest only fourteen years when she died. Later I went to the Post Office, and a lady tapped me on the shoulder and said, “When you are through with your business, come up to the office,” and handed me a card with the address. When I was through I strolled up to the office. I recognized her as one of the members of my audiences. There was a couple of gentlemen in the room, one a Frenchman, Massalie, and another Frenchman. As we sat talking I wondered why she had asked me to come up. I observed as I watched her she seemed to be distressed, and one side of her face was purple with erysipelas. I stepped over and asked her if it was because she was sick that she had asked me to come, and she said, “Certainly.” I laid my hands on her and began to pray, and as I prayed I was conscious of the Spirit coming in power, and that purple disappeared as I watched it. The healing was so remarkable that the gentlemen were surprised. 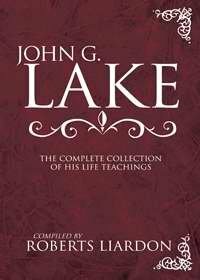 Massalie said, “Mr Lake, what is that?” I said, “Massalie, that is God.” He replied, “Oh, everything is God. I lived among the East Indians and everything is God.” The phrase was offensive to my spirit and I said, “Well brother, I do not want to discuss it.” He said, “Well if it is God, I’ll tell you how to prove it.” He said, “I put over a bad business deal, was very angry and in a high temper one day. Instead of opening the door gently, I opened it with a push. A lady happened to be behind the door. It took her an awful blow on the side of the head, she became unconscious, and in a few days we discovered the skull bone was fractured. Not only that, but the optic nerve had been detached and the eye became blind.” He had spent quite a fortune on the woman, but nothing availed. The eye remained blind. He said, “If that is God, you put your hands on her eye and pray sight back into that eye.” The Spirit was resting on my soul. I stepped over and began to pray. Instantly the Spirit came upon her until she was absolutely submerged in the Spirit. She remained in that condition a little while and this strange thing took place. After Mrs Lake died the little boy fell into a decline, and it required all the energy of my soul to keep that boy alive for months. Eventually he survived. After the incident had passed I asked her to write it. You get people to write things down so you can analyse them. Listen, it is not dragging spirits up, and it isn’t dragging some spirits down. There is nothing about calling spirits down from God in the Word; only about calling them up out of the depths. The Apostle Paul says he was “caught up to the third heaven.” (2 Corinthians 4:4) The attractive power is where the Lord Christ is. Jesus Christ is the attraction of the blood washed soul. If you are going to travel anywhere, you will go His way. “The wilderness and the solitary place shall be glad for them; and the desert shall rejoice and blossom as the rose,” and so on. All this took place as we sat in the office. Presently her eyes opened and she became normal. Her employer asked her what had happened, and if she could see. She looked out across the street to the market square and proceeded to read the signs on the wall. Then he brought a book of ordinary type and she read that. He handed her a Persian Bible he had on his desk. It had very fine type. She opened the book and began to read. I said, “Brethren, you have not seen the secret of that. No body came up to give that message, and nobody came down.” And they opened their eyes. That dear soul got through. She was a child of God and she started straight for the Lord. And so would you. The day that God sets your spirit free from this old temple, bless God, you will go straight to the Lord Jesus Christ. Now let me review a moment. Spiritualism is trying to drag the dead up to you. CHRISTIANITY, bless God, is making the blood-washed spirit free to go to the Lord. Just as opposite as night and day. Would it not? Where do you think it would go? Who occupies your mind? Who keeps your soul? Where is your treasure? In heaven, bless God! Well, you will go where your treasure is. You will go where the attraction is. Now I want to fix this in your mind. The blood-washed always go there, and if you ever talk to any one that is over there you will GO TO THEM. They are not going to leave the throne, but they will say, Brother, come up here. That is the only way you will ever communicate with them. In these days when this stuff is being proclaimed around the world by men like Lodge, Doyle and others who have been recognized as leaders of thought, naturally people are ready to listen. Years afterward as I considered these things, and discussed them with a brother, he said, “Lake, you had a wonderful opportunity. Tell me, what was the effect in your own soul of that night that you spent with these men?” I said, “Brother, I left there next morning with profound sympathy in my heart. I said as I walked away, ‘Dear God, here are the greatest intellects in the world, but concerning the things of God and the light of the Spirit they are just as blind as though their eyes were sealed.’” And their eyes were sealed concerning the light of God. Men come in the name of science. Naturally there is a certain reverence for knowledge, but don’t you be fooled. Just because somebody comes along with the light of worldly knowledge, no matter how minute and wonderful it may seem, the knowledge he has is worldly; the knowledge you have is heavenly. The knowledge that his soul possesses is material; the knowledge that your soul possesses is divinely spiritual, bless God. It comes from the heart of the Son of God. So when I came to Portland and Sir Oliver Lodge was announced to speak I did not take the train a day sooner in order to hear him. I would not take the trouble to go across the street if I could listen to every one of them, because they could not tell me anything that is vital. The vital things belong to the Kingdom of God, to the knowledge of Jesus Christ. The vital things belong to the Holy Ghost. It would take too long to tell of the thousands that have gone to spiritualism. I mean people honestly deceived. Just one instance. I had a little friend, Jude and his dear old wife. They were old fashioned Methodist people. They had one dear daughter who died at sixteen. I was absent most of the time in the city, but our home in the country joined theirs. Some friends said to me one night, “You know our old friends Jude whose daughter died, some months past a spiritualistic medium came to South Bend and they began attending. They have gone wild over the thing. We did not know how to help them, and wondered if you can not help them. I went over and had a talk with them, and went with them. At the proper time this gentleman was supposed to be giving them a message from their daughter. After they got through I said, “I would like to talk to her,” and I began to talk to this spirit. I said, “Are you Miss Jude? Where were you born? Where did you go to school?” “The Willow Street School.” Where did you attend church? “The Willow Creek Methodist Church.” The answers were perfectly correct. Finally I said, “I remember a night as the Willow Creek Methodist Church when a very wonderful thing happened to you. Do you remember what that was?” She did not know a thing about it. I said, “Your memory doesn’t seem to be good. Don’t you remember when a revival meeting was being conducted and you sat with Mr Lake and myself, and when the altar service came I invited you to go and give your heart to the Lord, and you did, and the glory of God came into your soul?” She did not remember anything about that. I said, “That is strange. Don’t you remember on certain occasions you used to come to our home and we used to kneel and the glory and presence of God came on your soul?” She did not remember anything about that. I said, “You are not the spirit of Miss Jude. You are an old liar. In the Name of Jesus Christ you get out of here.” And it got out. Beloved, do not be fooled by every voice you hear. One other thing, Conan Doyle is greatly distressed about President Coolidge, and he thinks the proper thing to do is to immediately confer with the spirit of the late President Harding and be directed about the things of state, or he will make some blunder. This is the advice of one of the greatest scientists of all the world, a man who has been knighted by the King of England because of his knowledge of scientific methods. Strange council, a darkened soul. Bright mind filled with knowledge of this world, but a darkened soul without a knowledge of eternal things. Do you see the distinction. The instance I told you of has been the practice of men whenever they have had opportunity to go to such matters. One of these days, the first time I hear somebody announcing that they are going to confer with President Harding, I am going to present myself. In case of a public man, his speeches are on record and they have been available to everybody. Here is an example. In Edenburgh I attended a seance where the medium was giving a wonderful message, supposedly from the spirit of the late W.E. Galdstone. I put in my pocket several copies of Gladstone’s addresses. I had a stenographer take down the message, and I took the old addresses I had in my pocket and this one that had come through the medium and compared them. I said,” It seems to me that something terrible has happened to W.E. Galdstone if he is the author of this message. The thing is not comparable with the things he uttered in his life. It looks to me as if dying has had an awful bad effect on him.” They were very much surprised. Most mediums have gotten wise now. Comparison is a wonderful thing. There is one source of knowledge; that is God. The sin of Spiritualism is in this fact; God said to His ancient people Israel,” Thous shalt not seek unto them that peep an mutter.” This describes the conditions prevalent in any seance. What should they do? “Shall not a people seek unto the Lord their God?” This Word of God does not even give me the privilege of seeking guidance of angels, let alone the spirit of the dead, or the spirit of a living man either. It gives me one privilege. There is One Mind that knows all, that is the mind of God, and if I am His child, and if my heart is made pure by the blood of His Son, then I have a right to come into His presence and secure anything my heart may want. I do not believe the world has ever began to conceive of the treasures of the wisdom of the heart of God. Our conception of the possibility of receiving wisdom and knowledge from God is very limited. Here is an experience from my own life. 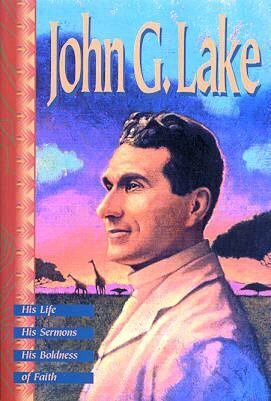 In the course of my preaching in Africa I observed I would begin to quote things from historical records that I had never heard. I could not understand it. After a while I became troubled about it and I must stop the practice. I was going on the record as part of my sermon, and I felt if you quoted something historical you ought to be able to lay your hands on the record in order to be convinced. Then I observed there was difficulty when I checked these utterances. Then I told my stenographer that when these unusual things would come, I would raise my finger and she was to put a special mark on these paragraphs. After a while I had quite a collection of them. When I came to the United States I had them with me. I was visiting in the office of Senator Chamberlain, talking with his secretary, Grant. As I sat talking with Grant I showed him the list and told him my experience. He was a Holy ghost baptised man. He said, “That is an easy matter. We have the most phenomenal man in the Congressional library here. You give him a quotation from any book, and he will tell you where to find it.” We sent the list into him one evening and left it with him overnight. The next day when we returned he told us just where we could find each one of these quotations. Oh, God, some day may we become big enough to know God, to appreciate our Christ, and our Saviour and the wonder of His soul and the Christian privilege of entering there!